This startling display at Tampere, Finland was experienced by Jari Luomanen (site) on 7th March ’04. 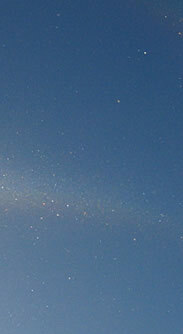 The halo forming crystals are called diamond dust and were in the nearby cold air rather than high-level cirrus cloud. Individual ice crystal glints are visible. “That particular image is very dear to me: it was taken during the absolute peak of the display that really didn't last all that long. Just as I took the image I simply had to extend my arm towards the upper tangent arc to try and see whether I could touch it, to stir the crystal swarm just a bit. I was able to stir the specks of light with my hand. I'll never forget it.” ©2004, Jari Luomanen, shown with permission.